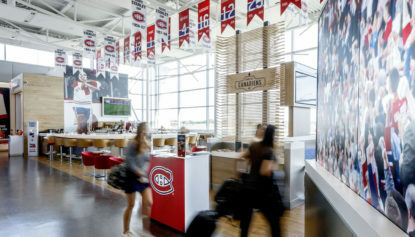 Passengers can now enjoy one of our recent projects first hand when traveling through Montréal–Pierre Elliott Trudeau International Airport (YUL). 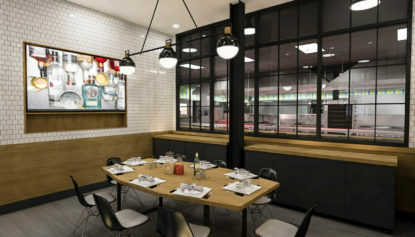 The Auberge Saint-Gabriel plays an important role in the cultural and gastronomic milieu of Montreal, an international city renowned for its food. 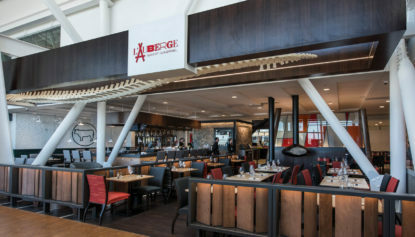 Our team was tasked in bringing this unique dining experience into the forefront of YUL Airport’s dining options. 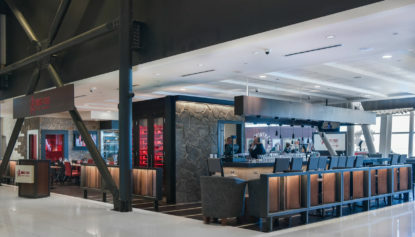 A comfortable and open lounge was created, filled with biscuit tufted black leather seating and rustic wood drum tables, which invites guests to relax with a mixed cocktail or enjoy a meal. 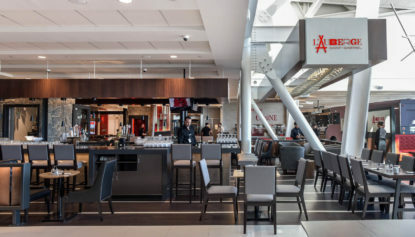 Consisting of 4,000 sq ft this space was a part of the existing concourse that was extended into the airport’s new addition. 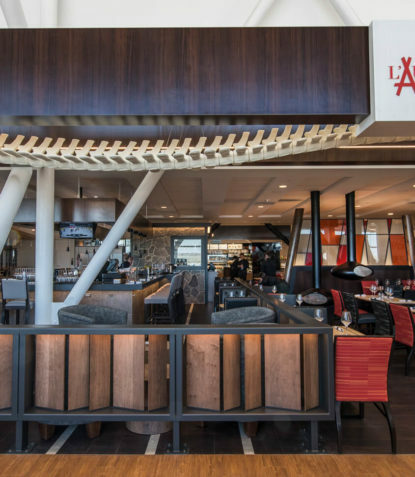 Finishes and furnishings were thoughtfully chosen to bridge the dining area to the lounge, positioned across the concourse. 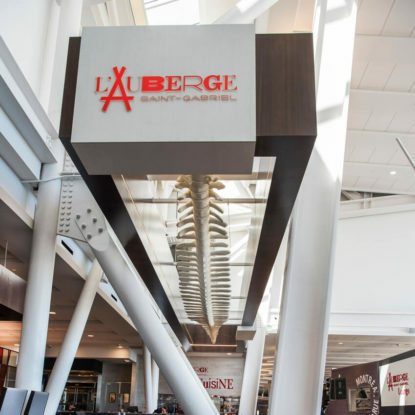 Alluring you to the space as you travel through the lively concourse, is the brand’s identifying whale vertebrae. Displayed in the original street-side location as the main attraction when entering, it was only fair that this location receives the same. The large vertebrae hover over the patrons and is emphasized with dramatic lighting in the evening. Added elements of stained glass, locally sourced lumber, and fireplaces add to the ambiance. 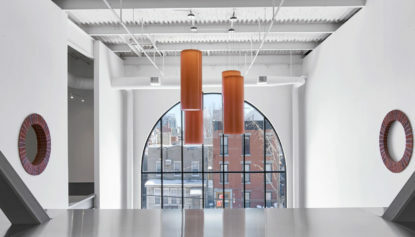 All materials for this project were chosen with sustainable practices in mind. 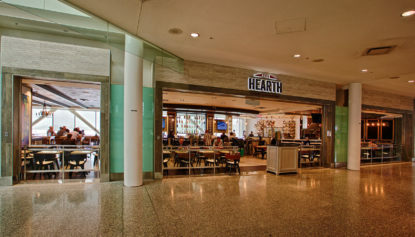 The materials are highly durable to withstand the heavy traffic generated by the airport and have recycled content, which is locally sourced and has low VOCs. 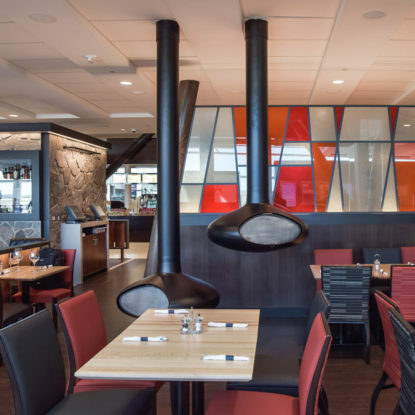 Elements of the restaurant’s identity, from the heavy stone walls, stained glass, dark wood tones, even the whale vertebrae, have been introduced to the space. The rich tones and leather fabrics provide a warm and cozy escape from the surrounding travelers.